Col. Chris Hadfield addressed delegates at the Kimberley Conference Athlete Training Centre. Oct. 16, 2017 3:22 p.m.
KIMBERLEY — The theme of the Columbia Basin Trust’s symposium this year was thriving in change, and who better to inspire Basin residents to meet future challenges with audacity and passion than the first Canadian ever to walk in space. Col. Chris Hadfield — who on April 22, 2001, became the first Canadian to do just that — addressed delegates at the Kimberley Conference & Athlete Training Centre on Friday night in a keynote address that would inspire those who heard it throughout the weekend. Hadfield began by talking about the people who inspired him to become an astronaut — Buck Rogers, Captain Kirk, Yuri Gagarin, who was the first man in space, and Neil Armstrong. “It was Neil that really impressed the heck out of me. Because, I mean, look at him. He is not Captain Kirk. Look at him. He just looks like a guy, like if you needed to get your oil changed, Neil would be the guy in the garage there,” said Hadfield. He went on to describe watching the lunar landing when he was nine and how Armstrong had to manually land the lunar module with a billion people watching him after it turned out that the designated landing site was unsuitable. “That’s what inspired me. That you could turn yourself into somebody like that,” he added. Beyond his own inspiration for becoming the kind of guy who could walk in space and become the first Canadian commander of the International Space Station (ISS), Hadfield also talked about the people whose audacious ideas had inspired and were inspiring others — from John F. Kennedy’s challenge to NASA in 1961 to put a man on the moon before the end of the decade to the Canadian Space Agency launching Allouette-I. “If you give yourself a crazy challenge and then work and cooperate like we never had before suddenly this becomes part of the human experience. This it the reality of where we are,” he said in reference to being aboard the ISS when it passed through the Southern Lights. He also spoke about those whose audacious ideas will lead the human race to future discoveries, citing the example of Elon Musk’s company SpaceX, which Wednesday, Oct. 11 successfully landed a reused rocket on the company’s “Of Course I Still Love You” droneship stationed in the Atlantic. The same rocket, Falcon 9, was successfully landed on the “Just Read the Instructions” droneship in the Pacific on Monday, Oct. 9. 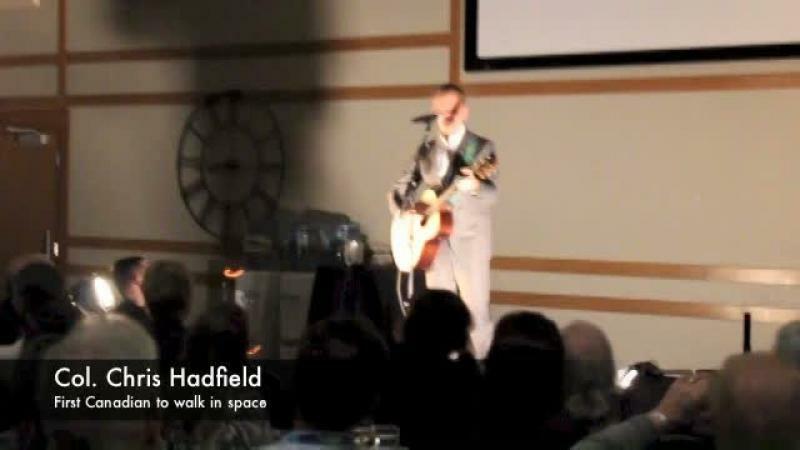 Of course, Hadfield also works to inspire the next generation, just as Armstrong inspired him, and many young would-be astronauts were at Friday night’s presentation. One of them was Austin Harris, age 12, who’s a big fan of Hadfield and has listened to the audio book of his memoir, An Astronaut’s Guide to Life on Earth, three times. “I’m kind of following in his tracks and being prepared for pretty much everything that the world throws at [me],” said Harris, who would like to one day be an astronaut.